She was invited to an ABC News Breakfast interview with Virginia Trioli and Jeremy Fernandez on 5th April. The interview was to wrap up efforts around Endometriosis Awareness month in March and coincided with an online ABC article by Patrick Wood and a piece in The Age / Sydney Morning Herald by Aisha Dow. Both print articles contained interviews with patients with endometriosis and researchers / clinicians from the Department of Obstetrics and Gynaecology at the Royal Women’s Hospital: Professor Peter Rogers and Associate Professor Martin Healey. 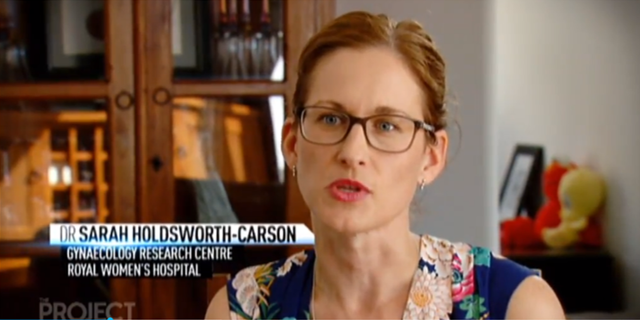 Dr Holdsworth-Carson’s research was also featured in an interview featured on the Project on 13th April 2018. The timing of all of this publicity was triggered by an apology to women from Greg Hunt, the Health Minister and the announcement that the Australian Government will produce an National Action Plan for Endometriosis, focusing on improving research, awareness and education, and clinical management and care for endometriosis.